He was born in the Mino province. 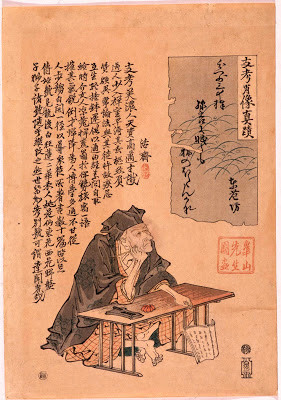 He was the one who made Basho's poems known all over Japan after the death of his master. He wrote a lot more about haiku theory than hokku. Later, Kaga no Chiyo-Ni became his student. 'Shigure Hamaguri' was named by Kagami Shiko. He was a Zen acolyte at temple Daichi-Ji 大智寺. 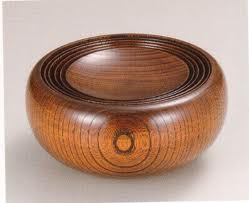 He was one of Basho's 10 most important disciples.
. Kaga no Chiyo-Ni 加賀千代（尼） .
. ooryooki 応量器 begging bowl .
. Haikai juuron 俳諧十論 Haikai Juron, Ten arguments about Haikai . Haikai is not something special, it is to tell a lie gracefully / skillfully. But do not explain this to people who do not understand the real from the fake. This is only a "swing with one sword" for the disciples of Basho. Hokku for a statue of Shussan Shaka 出山釈迦 "Shaka coming out of the mountains". by his disciple in Edo, Torii Bunrin 鳥居文鱗. In 1683, when Basho moved to the second Basho-An in Fukagawa, Bunrin gave him a statue of Skakyamuni coming down from the mountains, which Basho cherished a lot. Before Basho died at Osaka, he gave this statue to Kagami Shikoo 各務支考 Shiko.